Back at War Memorial Gym for their first home game of the season, the men’s volleyball team put on two thrilling matches over the weekend: a riveting five-set home opener on Friday, November 3 and a solid 3-1 win on Saturday, November 4 against the Calgary Dinos. On Friday night, the ’Birds fought back from third and fourth set defeats to take down the Dinos in the fifth. Initially, the T-Birds looked to control the match, taking the first and second set with a four point spread in each. Although it was hard for the ’Birds to find a way to break through the blocking line of the Dinos in the beginning, they quickly found their path in the latter half of the sets. In both the first and second, the T-Birds defended well against several aggressive Dinos’ attacks and continued to widen the score gap, sending them through to two wins. The relaxed atmosphere on the court for the Thunderbirds shifted in the third set when the Dinos came back with more firepower. Calgary found their way to a 9-5 lead early, then continued to keep their advantage to a three-point gap. In the final stages of the set, at 24-19 for the Dinos, UBC started to catch up and pushed the score back to 24-23. In the end, though, Calgary would hold off the home side, taking the third 25-23 off an attack error by the ’Birds. 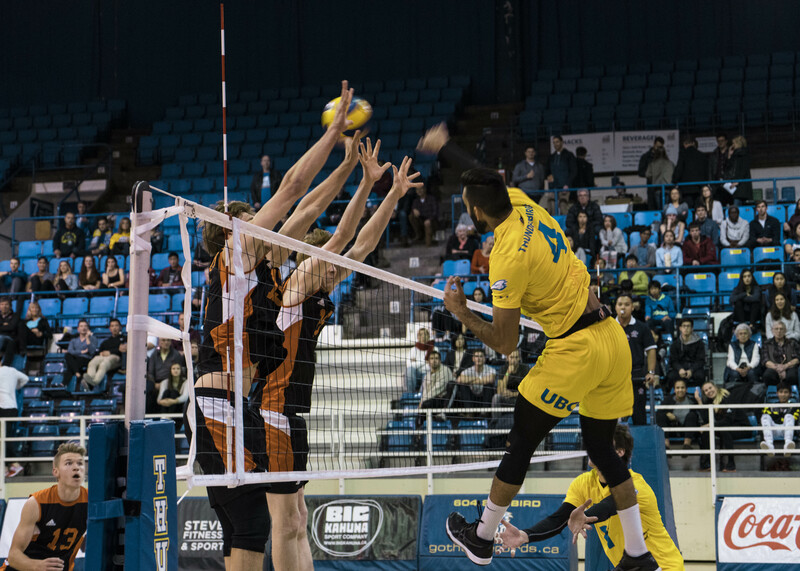 The fourth set was a head-to-head rally, yet the Dinos slowly tipped the scale in their favour in the last 10 points, again taking a minimal advantage right to the end with a 25-22 win — forcing a fifth set. The final set was full of ups and downs, as the T-Birds regrouped with strength and took the lead until the eighth point. After that, the Dinos raised the tension between the two teams, matching the ’Birds point for point into the home stretch. 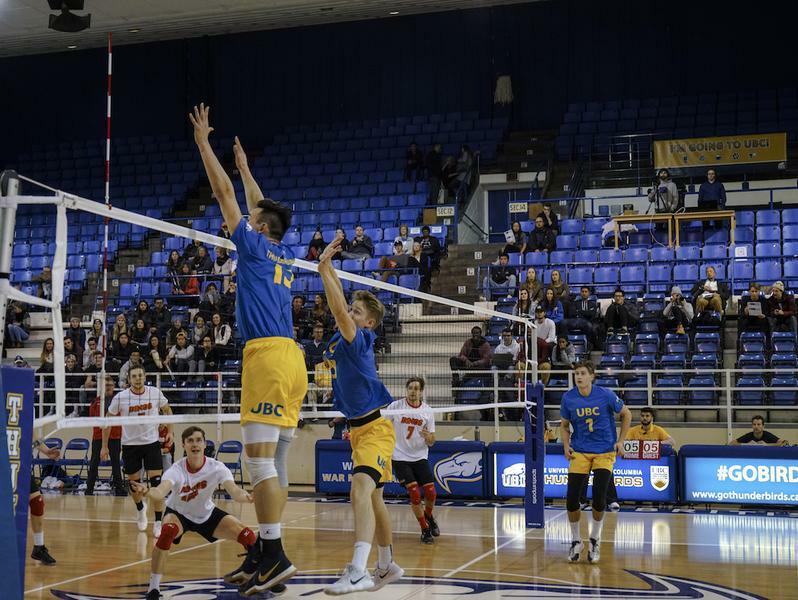 Finally, with a kill from UBC's Irvan Brar, the T-Birds ended the set at 15-13 after the lengthy two-hour game. First-year player Coltyn Liu impressed in the home opener as he joined the starting lineup — throughout the match, he showed his potential to be a key player this season. He joined the top three Thunderbirds in terms of kills on the evening, with nine in total — just behind veterans Mat Guidi with 10 and Brar with 19. “I’m pretty happy with how Coltyn played through the game. I think he’s going to be great for us, whether in the next game or the long run,” said UBC head coach Kerry MacDonald of the first-year. The T-Birds triumphed once again the following evening, taking the Dinos to a fourth set before sealing the deal with a 3-1 win. Next weekend, the team will hopefully keep the home momentum going when they face the Thompson Rivers University Wolfpack on November 9 and 10 at War Memorial Gym.